Centaurus A is a peculiar galaxy located in the southern constellation Centaurus. It is the fifth brightest galaxy in the night sky, the nearest giant galaxy to the Milky Way, and one of the nearest radio galaxies to Earth. Its exact type is uncertain, but it is usually classified either as a giant elliptical or lenticular galaxy. The galaxy’s exact distance from Earth is also uncertain, but estimates generally range from 10 to 16 million light years. 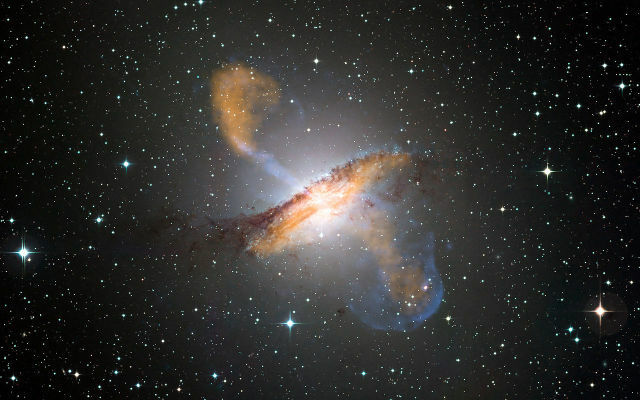 Centaurus A has the designation NGC 5128 in the New General Catalogue. The galaxy’s name, Centaurus A, dates back to the 1940s and 1950s when radio astronomy was a relatively new field of study and radio sources in the sky were named by letters, with A designating the strongest radio source found within a given constellation. Centaurus A was the first bright source of radio emissions discovered in Centaurus. The unusual appearance of Centaurus A has earned it the nickname the Hamburger Galaxy, which it shares with Sarah’s Galaxy (NGC 3628), an edge-on spiral galaxy in Leo constellation and one of the three galaxies that form the Leo Triplet (Messier 65, Messier 66, NGC 3628). When observed in optical wavelengths, Centaurus A looks like an elliptical galaxy. However, ellipticals don’t typically have dust bands because they are dust poor and contain mostly old stars. 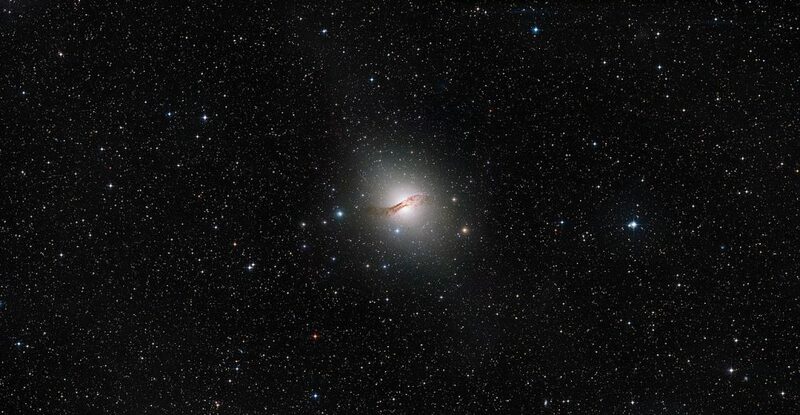 Astronomers believe that Centaurus A is in fact a giant elliptical galaxy currently in the process of devouring a dusty barred spiral galaxy about the same size as the nearby Triangulum Galaxy (Messier 33). The elliptical galaxy is believed to have assimilated its smaller neighbour about 200 to 700 million years ago. 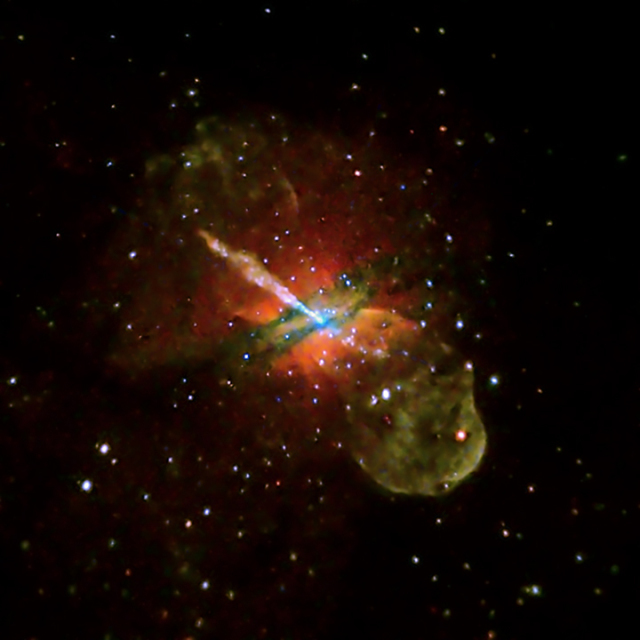 Centaurus A is a popular target among both professional and amateur astronomers. 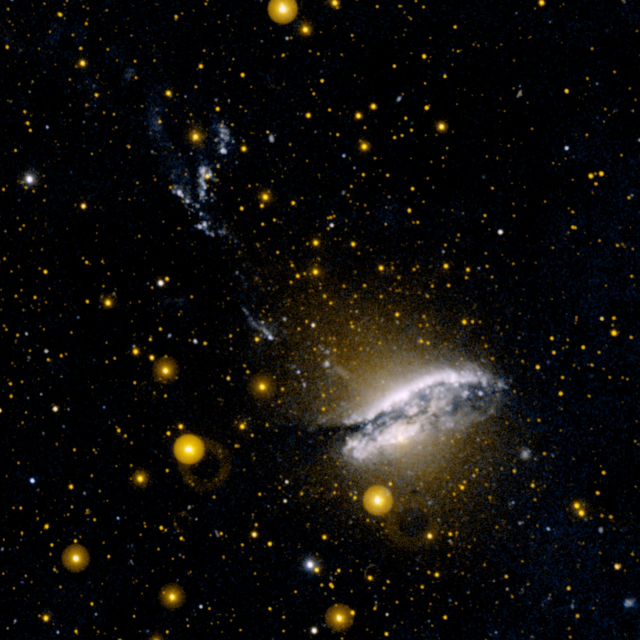 As one of the closest radio galaxies to the solar system, NGC 5128 and its active galactic nucleus have often been an object of study, while amateur astronomers like to observe it because it is one of the brightest galaxies in the sky and relatively easy to find. Centaurus A lies far to the south and can only be seen from the southern hemisphere and low northern latitudes. The galaxy lies about 4 degrees north of the globular cluster Omega Centauri, which can be seen without binoculars. The galaxy’s central bulge and the dust lane can be seen in large binoculars and amateur telescopes, but additional details are only visible in larger telescopes. The galaxy is located near the centre of Centaurus constellation. It lies to the southwest of the bright star Menkent (Theta Centauri) and northwest of the even brighter Alpha and Beta Centauri. Centaurus A is the nearest active galaxy to the solar system. It is a starburst galaxy, with more than 100 regions of star formation identified in the galaxy’s disk. The galaxy’s bulge, on the other hand, contains mostly evolved red stars. The starburst activity in the disk is believed to be a result of a collision with another galaxy. The peculiar nature of Centaurus A, now believed to be a result of a galactic merger, was first documented by the English astronomer John Herschel in 1847. From Earth, NGC 5128 appears like an elliptical or lenticular galaxy with a superimposed dust lane. The galaxy was included in Halton Arp’s Atlas of Peculiar Galaxies (1966). Centaurus A was first discovered by the Scottish astronomer James Dunlop from the Parramatta observatory in New South Wales in Australia on August 4, 1826. Dunlop included the galaxy as number 482 in his “A Catalogue of Nebulae and Clusters of Stars in the Southern Hemisphere observed in New South Wales,” published in Philosophical Transactions of the Royal Society, Volume 118 in 1828. Centaurus A was identified as a radio galaxy by astronomers John Bolton, Bruce Slee, and Gordon Stanley in 1948-49. They had studied the galaxy using a sea interferometer at Dover Heights in Australia. The galaxy’s radio emissions were among the first discovered to be associated with an extragalactic object. 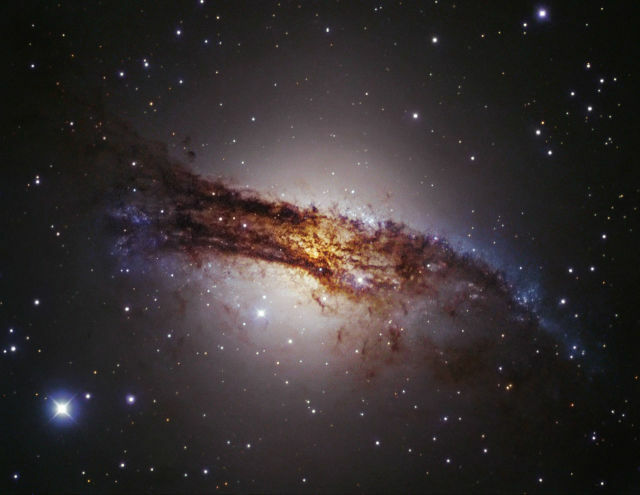 German astronomers Walter Baade and Rudolph Minkowski studied Centaurus A at the Palomar Observatory in California and confirmed that it was indeed a galaxy. They also suggested that the galaxy’s peculiar morphology, with a superimposed dark dust lane, was the result of a merger between a giant elliptical and a small spiral galaxy. American astronomer Stuart Bowyer detected X-rays emanating from NGC 5128 in 1969-70. 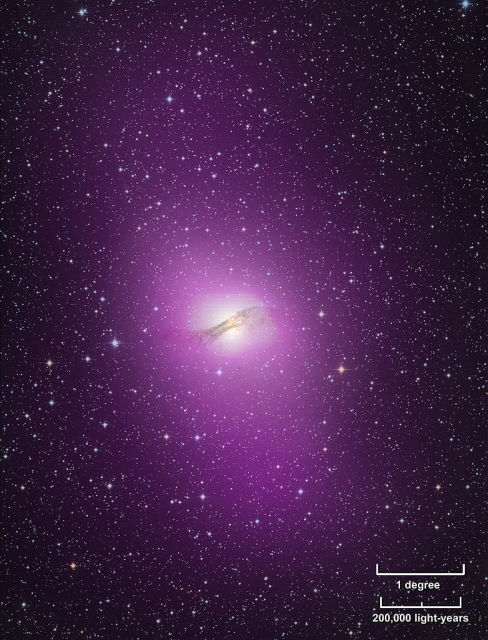 The UHURU satellite confirmed that the X-ray emissions were indeed coming from Centaurus A in 1970. R.D. Hall discovered gamma-ray emissions in 1974-76, likely emanating from the galaxy’s nucleus. An X-ray jet coming from the galaxy’s central region was first discovered in the 1970s. Astronomers later observed the jet in radio wavelengths. Centaurus A is one of the few deep sky objects that can be detected across all energy ranges of the entire electromagnetic spectrum. The galaxy is even sometimes considered to be a source of Ultra High Energy Cosmic Rays (UHECR). The galaxy’s core spans only 10 light days, which makes it one of the smallest extragalactic radio sources known. Centaurus A is the central galaxy in one of the two subgroups of the Centaurus A/M83 Group. The Southern Pinwheel Galaxy (Messier 83) is at the centre of the M83 Group. 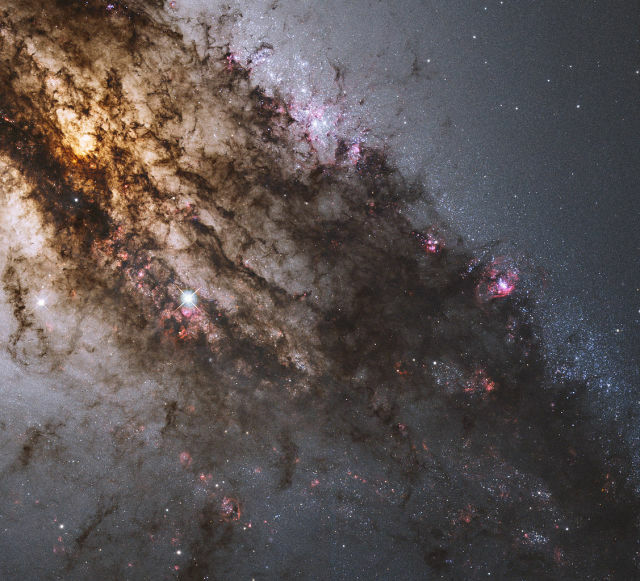 The Centaurus A/M83 Group is a located in the Virgo Supercluster, relatively near to us. It is sometimes identified as a single group of galaxies and sometimes as two groups. The galaxies in the group are gravitationally bound and do not appear to move relative to each other. A supernova was detected in Centaurus A in May 1986. Designated SN 1986G, the supernova was discovered by R. Evans and later classified as a Type Ia supernova, a violent explosion of a white dwarf. The supernova was discovered in the south-eastern part of the galaxy’s dust lane. In 2003, a team of astronomers at the European Southern Observatory detected thousands of luminous red giants similar to Mira (Omicron Ceti), a famous long-term pulsating variable star located in Cetus constellation. The stars were discovered in the galaxy’s halo and near its bipolar jets. In 2015, scientists discovered a new class of “dark” globular clusters around Centaurus A using ESO’s Very Large Telescope in Chile. The clusters appear similar to other globulars detected around the galaxy, but are considerably less massive. The centre of Centaurus A contains a supermassive black hole with an estimated mass of about 55 million solar masses. “This is something we’ve never seen before in gamma rays,” said Teddy Cheung, a Fermi team member at the Naval Research Laboratory in Washington. “Not only do we see the extended radio lobes, but their gamma-ray output is more than ten times greater than their radio output.” If gamma-ray telescopes had matured before their radio counterparts, astronomers would have instead classified Cen A as a “gamma-ray galaxy.” The gamma-ray output from Cen A’s lobes exceeds their radio output by more than ten times. High-energy gamma rays detected by Fermi’s Large Area Telescope are depicted as purple in this gamma ray/optical composite of the galaxy. Credit: NASA/DOE/Fermi LAT Collaboration, Capella Observatory. Material in the galaxy’s dense core region releases enormous amounts of energy as it spirals toward the black hole. The jet ejected by the black hole is a source of X-ray and radio emissions. The inner parts of the relativistic jet are moving at an approximate speed of 9 million kilometres per minute, or half the speed of light. The galaxy’s radio jets span more than a million light years. In X-ray wavelengths, the jet extending to the northwest is about 25,000 light years long, while the one extending southwest is significantly less conspicuous. Astronomers suspect that the more prominent jet is moving in our direction, while the other one is moving away from us. The galaxy’s central region also has a number of smaller X-ray sources. These are suspected to be neutron stars and stellar-mass black holes that are accumulating material from nearby stars.